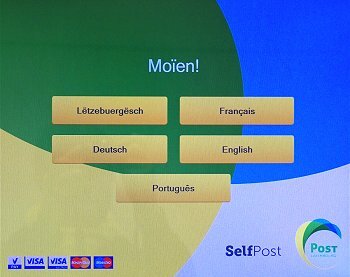 Since 2013, POST Luxembourg has been involved in an ambitious transformation of its sales network designed to respond to new postal requirements. This has included extending opening hours and offering convenient and easy to access options and services. 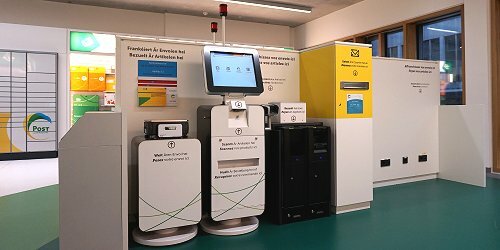 To this end, since the end of 2015, POST Luxembourg has installed nearly 100 PackUP stations for parcels, and opened about 50 new Point POST, postal points of sale installed in local shops and supermarkets. 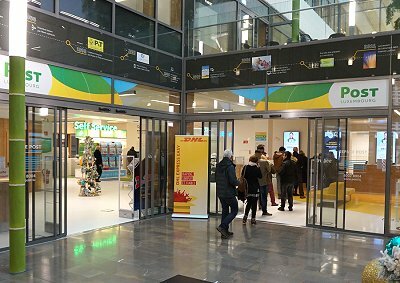 But perhaps one of the most interesting initiatives is the creation of the Espace POST, the new commercial spaces that combines all the POST products and services (telecommunication, post and finance) in one place, with extended opening hours. 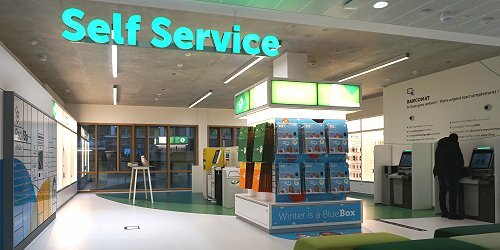 Each Espace POST is organized into three zones; Connect, with all the telecommunication offerings, Express, with counters for postal and financial services, and a Self Service zone. 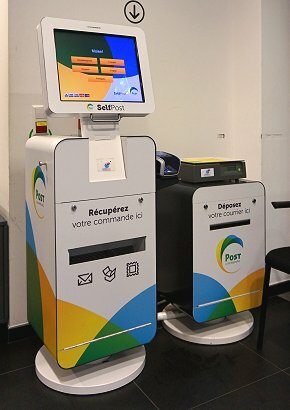 In the area with various postal and banking self-service equipments, customers can purchase all the products distributed by POST e.g. packaging, prefranked envelopes, philately, etc., in addition to other products such as smartphone accessories, through the new Cash & Carry kiosks. The first Espace POST was opened in early August 2017, in the new (and temporary) POST Luxembourg headquarters in Mercier building on the rue de Reims (images). This Espace POST is located very close to the former post office and the Shop Telecom of Luxembourg Gare, where the new POST Luxembourg headquarters is being built. Other Espace POST locations were opened months later in Dudelange, Marnach and Boulevard Royal, in the center of Luxembourg. 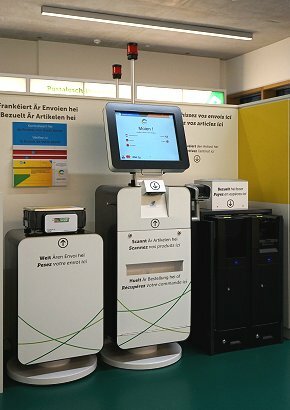 The new Cash & Carry kiosks were developed by the Hytech - PostalVision company based on the SelfPost kiosks installed in Luxembourg from December 2012 (see articles, also published in VARIABLE 27, 29 & 35). 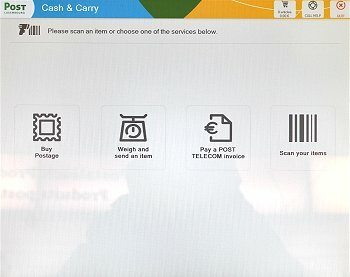 In addition to the left hand unit equipped with scales for weighing postal items, the new Cash & Carry kiosks are fitted with a scanner under the touch screen for reading barcodes and an additional unit on the right side for payment with coins and banknotes. 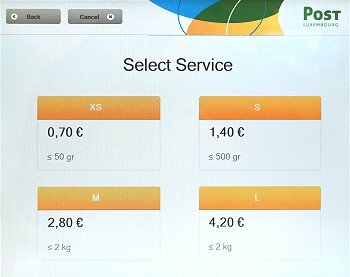 But possibly one of the most interesting developments are the new services offered by the new kiosks. 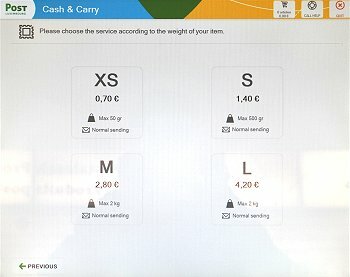 As can be seen in the screen shot sequence below depicting comparisons between the SelfPost and Cash and Carry kiosks, the main menu offers two new options. 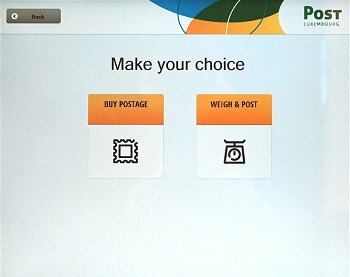 In addition to the direct purchase of stamps by selecting the destination zone and the weight and / or size ('Buy Postage') and the purchase of stamps using the scales on the side ('Weigh & Post'), the 'Cash & Carry' kiosk enables the payment of POST Telecom invoices and the direct purchase of products on display via the bar code scanner. 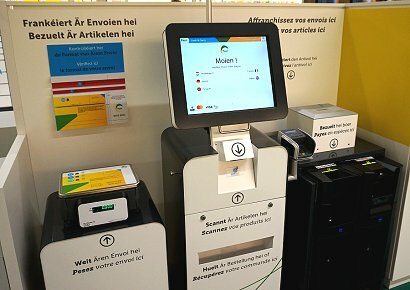 At the end of 2018, POST Luxembourg had 22 Hytech-PostalVision kiosks; 12 SelfPost and 10 Cash & Carry kiosks. 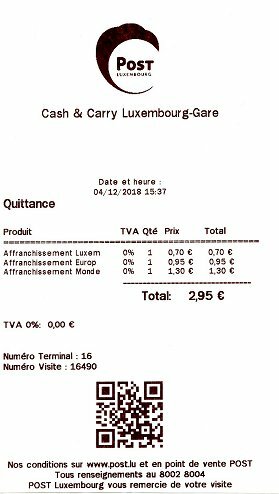 Two of the SelfPost kiosks were not in service on those dates (02 and 10), and three Cash & Carry do not have the option to issue variable value stamps (17, 18 & 20). The new 'Luxembourg's Signature' is part of a series of communication tools, rolled out in October 2016, for promoting the Grand Duchy of Luxembourg abroad. The country's new visual identity consists of the symbol X, made up of four red and blue arrows forming part of the name of the country, and the invitation 'Let's make it happen'. 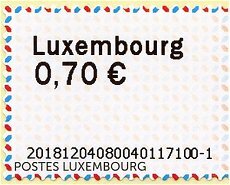 Also in October 2016, POST Philately issued a set of three stamps depicting the new 'Luxembourg's Signature'. 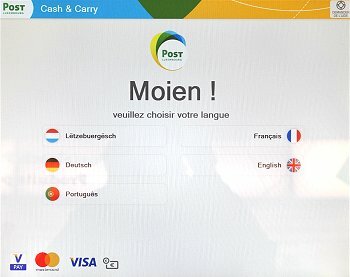 Four years after the issue of the previous design, depicting the coat of arms of the Grand Duchy (see article, also published in VARIABLE 35), POST Luxembourg released a new design for the rolls of labels to be used in its Hytech-PostalVision postal kiosks. 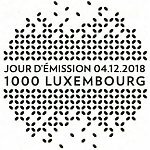 The new design which incorporates aspects of the 'Luxembourg's Signature' is by the local Vidale-Gloesener graphic studio. The rolls of thermal self-adhesive labels printed in offset are manufactured by the Dutch Royal Joh. Enschedé security printing company. The size of the label is 56 x 25 mm. with perforations around the edges. 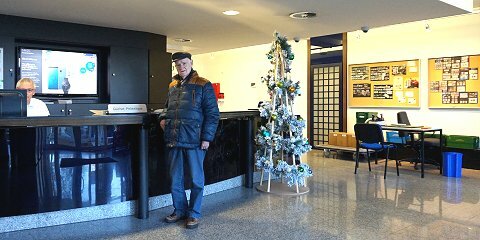 The new issue could be obtained through the philatelic service, printed on its back office computer system, and also available in most SelfPost (left image) and Cash & Carry (previous section) postal kiosks, from December 4th 2018. The three types of equipments produce a similar impression on the labels, with the zone indicator and the face value in the upper left corner, and a unique code for each stamp at the lower left. 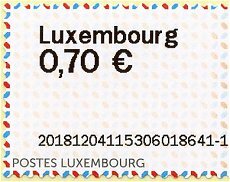 The philatelic service sells stamps with a single face value, the first domestic mail rate on the date of issue, Luxembourg 0.70 EUR. On all the stamps the 20-digit lower code includes the year, month, day and hour of the first day of issue (2018 1204 0800), followed by the machine number (40), and the sequential operational number. 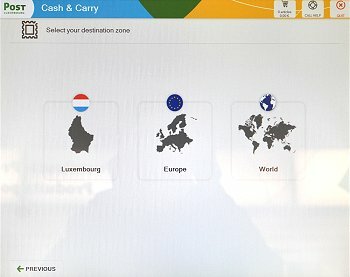 For their part, postal kiosks can issue variable value stamps with three zone indicators ('Luxembourg', 'Europe' and 'Reste du Monde') and the face value according to the size and / or weight of the postal item. The lower 20-digit code is also made up of the current year (4 digits), month (2 digits), day (2 digits) and hour of issue (4 digits), the machine code (2 digits), and finally a unique number -not related- for each stamp. Although the impression of the three types of equipment is very similar, it is possible to recognize differences in printing. Thus, for example, the length of the word 'Luxembourg' is 21.5 mm. in stamps issued by the philatelic service, 19.5 mm. in those issued by the SelfPost postal kiosks, and 20.8 mm. in those issued by Cash & Carry machines. 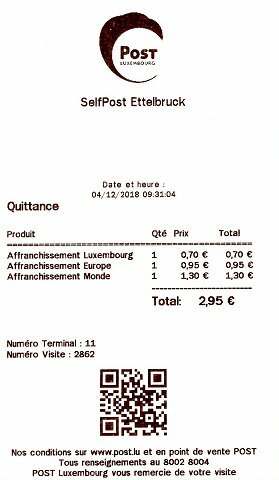 First day receipts of the basic set with the first postage rate ​​for the three tariff zones, Luxembourg, Europe and Rest of the World, issued by SelfPost and Cash & Carry postal kiosks. POST Philately produced a special pictorial postmark for the new issue, which could be obtained in the new offices of the philatelic service (image below), in the Cloche d'Or district, south of the capital. The contents of this page and the website in general are protected by copyright.